Coconut water, obtained from the endosperm of the coconut fruit, is one of the healthiest drinks in this whole world. Even celebrities like Demi Moore and Madonna vouch on the benefits of coconut water. Coconut water was used intravenously to save the lives of the people during the World War 2. It helped to treat stomach related problems like cholera and gastroenteritis in the victims. Coconut belongs to the Arecaceae family and is scientifically known as cocos nucifera. The trees are most commonly found in the tropical environments. It is fondly referred to as the “Tree of Life” because of its phenomenal health benefits. A coconut tree yields more than 150 to 200 coconuts a season. A single coconut contains 200 to 100 ml of water. This depends entirely on the type of cultivar and size of the coconut. A young coconut of five to six months is perfect for obtaining water. Coconut more than six months oil is completely devoid of nutrients and even contains less water. This clear liquid is sterile and contains chock full of unique chemicals. Coconut water is composed of sugar, vitamins, electrolytes, amino acids, Phyto-hormones and enzymes. Cytokines in coconut water provide anti-thrombotic, anti-ageing and anti-carcinogenic properties. It also boasts of minerals like calcium, manganese, iron, zinc and magnesium. Besides, it is also rich in B complex vitamins like riboflavin, thiamin, thiamin, folate and pyridoxine. Coconut water provides 2.4 milligrams of vitamin C per 100 ml. The bioactive enzymes present in coconut water help in the digestion and absorption of nutrients. The high content of fiber in coconut water reduces the occurrence of acid reflux, while reducing the sensation of nausea and vomiting. It helps to replace the fluid loss from the stomach, thereby reducing the need of intravenous therapy. In fact, the osmolarity of coconut water is greater than the osmolarity of WHO ORS. Coconut water is the best bet to treat hydration caused due to dysentery, cholera and other stomach disorders. Potassium and sodium in coconut water help to replenish the electrolyte deficiency caused due to diarrhea. Consume coconut water at the start of each day to balance these electrolyte levels. The monounsaturated fatty acids found in this refreshing drink increase the good cholesterol and reduce bad cholesterol in the blood. It promotes blood circulation in the body, preventing the plaque formation. Coconut water is also beneficial for improving the blood pressure levels. This helps to reduce the risk of heart attack and other cardiovascular diseases. Coconut water can also help to control the blood sugar levels. It improves insulin sensitivity and glucose utilization, preventing the possibility of type 2 diabetes. The high levels of glucose in coconut water increase the metabolic rate, preventing blood sugar fluctuations. Coconut water is extremely effective in treating abdominal fat, the most dangerous fat in the body. This low fat beverage keeps you full for longer, reducing cravings and appetite. It is also low in fat, so you can consume as much as you want, without worrying about its effect on your waistline. A daily consumption of coconut water can reduce both waist circumference and BMI. Coconut water is rich in nutrients like folate, riboflavin, thiamin and pyridoxine. The anti-viral and anti-bacterial properties of coconut water improve the body’s immune system to fight flu and viral infections. Coconut water is highly recommended for pregnant women. It helps to fight heartburn and constipation in women. The naturally sterile nature of coconut water improves the immunity of the baby and mother, preventing the onset of several diseases. Coconut water is extremely useful in boosting the levels of amniotic fluid in the body, thereby improving the overall health of the fetus. Lactating women can safely serve coconut water to their infants. The amount of lauric acid present in coconut water is equal to the amount present in mother’s milk. Coconut water can help you get smooth and younger looking skin. Cytokines in coconut water help to regulate the cell growth and ageing process while potassium and lauric acid balances the pH levels and strengthens the connective tissues, reducing the risk of age related diseases. The high levels of antioxidants in coconut water keep the tissue hydrated and strong. Apply coconut water on the skin to reduce wrinkles, sagging skin, cellulite and age spots. Coconut water can cure a range of urinary ailments and bladder infections. Coconut water acts as a diuretic into increase the flow and production of urine. It contains lauric acid and monolaurin, which prevents urine infection. The urologists recommend drinking coconut water every day to reduce the size of kidney stones and eliminate them. Consuming coconut water before taking drinks can prevent a terrible hangover. Coconut water will replace the essential electrolytes that flow out of the body when you experience vomiting and urination after a heavy drink. This thirst quencher is an excellent alternative to water and energy drinks for improving the hydration of the body. It contains 295 milligrams of potassium and 5 grams of natural sugar per glass, unlike over the counter energy drink that contain half the potassium content and five times more sugars. Sugar and glucose replace the fluid and minerals that are lost during the physical activities. Since coconut water is isotonic to human plasma, you can use it in extreme difficulties to hydrate the human body. 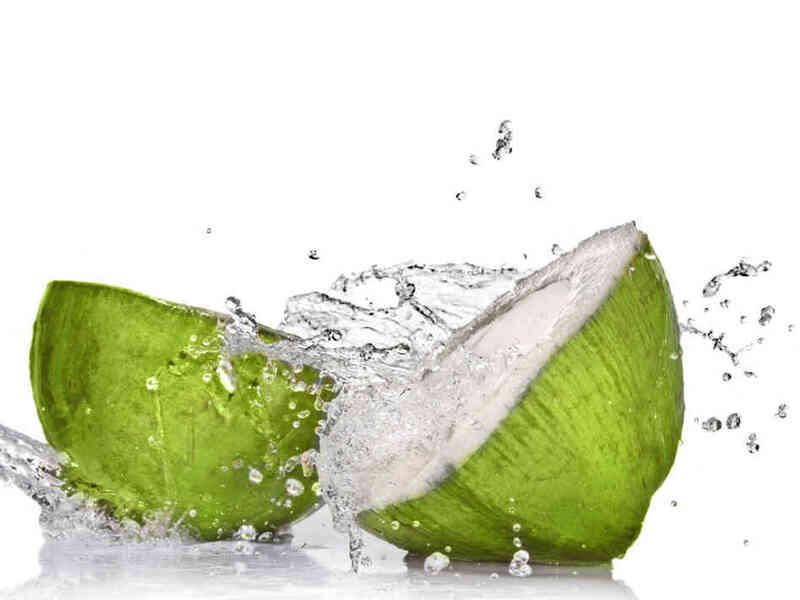 Coconut water is used as an active ingredient in most of the shampoos, oil, creams and lotions. Application of coconut water can clear and tone the skin. It improves the moisture level in the skin, keeping it well conditioned. It also boosts the oxygen level of the skin, giving you a flawless complexion. A regular complexion can also lower the risk of skin cancer by 20%. The anti-fungal and anti-bacterial properties of coconut water can treat skin infections like folliculitis, cellulitis and erysipelas. Apply some coconut water liberally on the skin and leave it for some time. You can also add coconut water to your bathing water. To treat oily and patchy skin, wash your face daily with coconut water. It removes excess oil from the skin, preventing breakouts. Coconut water also controls excess shine of the T zone. This delicious drink can also reverse suntan. Mix 1 teaspoon of Multani mitti with coconut water and apply it on the tanned areas. Leave it for 20 minutes and then wash it off with cold water. Coconut water improves blood circulation in the scalp, thereby strengthening the hair follicles and promoting hair growth. You can also use coconut water as a hair rinse. It moisturizes the scalp and penetrates into the hair shaft, leaving the hair soft, smooth and manageable. The antibacterial properties of coconut water can also prevent dandruff and scalp psoriasis. Coconut water is readily available in packets and bottles. However, avoid consuming packaged coconut water as it contains additives and preservatives, which can negate its benefit. Coconut water is best enjoyed without any addition. However, you can add mint leaves, lemon slices and orange zest to make it more appetizing. Not just the water, coconut meat kernel is also very sweet and delicious. The endosperm solidifies and thickens to form an edible kernel. Avoid coconut water that comes with hard brown shells, as this indicates its maturity. Shake the nut to gauge how much liquid it contains. You can store tender coconut at room temperature for 3 to 5 days. The fresher the coconut water, the safer it is to consume. Once opened, consume the water immediately as it can ferment and lose its nutritional due to its enzymatic activity. There is no hard and fast rule regarding the amount to be consumed. Medical experts suggest that you can consume 8 ounces of coconut water daily if you are maintaining an active lifestyle. People suffering from heart and kidney diseases should avoid consuming excess amounts of coconut water. People on a low-potassium diet should also be careful with their coconut water intake as the water is high in potassium and too much potassium can affect the heart. Excessive consumption of coconut water can have a laxative effect in the body.